Joey Daccord has had quite a week. And perhaps the best is yet to come. 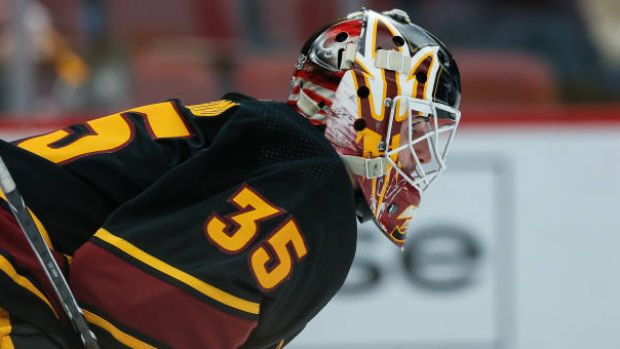 The goaltender became the first Arizona State player to sign an NHL contract Tuesday when he inked a deal with the Ottawa Senators. Daccord joined his new team Wednesday in New York, where the Senators defeated the Rangers 4-1 at Madison Square Garden. And Thursday, he is scheduled to make his professional debut when the Senators play at Buffalo. "I think my parents are going to come," Daccord told the Ottawa Sun. "My little brother, big Al, he's getting out of school so he's excited. My grandparents up in Montreal are going to come down and I think Coach (Greg) Powers from Arizona State is going to make it so ... should have a pretty good crew. They're all just really happy for me. Actually my two best friends from home, Colin and Jack, they're going to make it as well. They'll be pleased I gave them a little shout out." Daccord went 21-13-1 with a 2.35 goals against average and a .926 save percentage this season in leading Arizona State, in just its fourth year in Division I, to the NCAA Tournament. He's one of five finalists for the Mike Richter Award, given to the most outstanding goalie in the NCAA. The past few days have been a whirlwind for Daccord. "It was quite the experience, 24 hours after everything coming together," he said. "The practice, team flight, hotel, New York City. It's pretty cool being in the Big Apple for my first road trip. Driving through downtown was pretty cool." Daccord said being told he was starting in Buffalo was an "indescribable" feeling. "This whole experience, I thought I'd be a little more nervous than I am," he said. "I've actually surprised myself a little bit with how calm I've been all week. At the end of the day I've been playing hockey my whole life and it's just another hockey game. That's the approach I'm going to take. I'm just going to try to go out there and have a good time. Hopefully get a win." The Sabres and Senators, who are 14th and 16th, respectively, in points in the 16-team Eastern Conference, have been playing out the season in much different ways. The Sabres have lost eight games in a row, including a 3-2 defeat at home Tuesday against Nashville. "We talked about these last two home games, and the guys brought it (Tuesday), and we need that emotion and we need that passion on Thursday (against the Ottawa Senators)," Sabres coach Phil Housley told reporters. "They should be (ticked) off. We're all (ticked) off. But we have to, again, garner that and bring that same effort, because if we play like that, we're going to win." Jeff Skinner scored his 38th goal of the season, a career high, in the loss to the Predators. It was just his second goal in the past 23 games. "It's been a while, so it's nice to get a goal, (but) I think you score to win games, so it's frustrating we didn't get a win," Skinner told NHL.com. The Senators, who have clinched the league's worst record, have gone 7-8-1 under interim coach Marc Crawford.